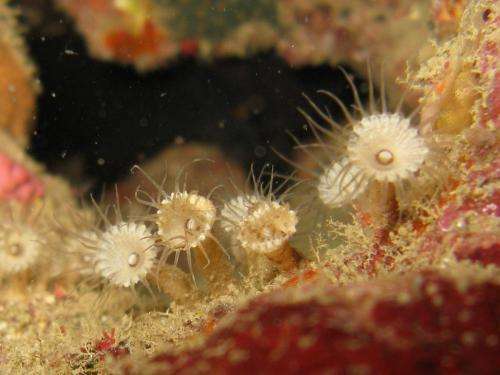 Research primarily conducted in Okinawa, Japan, by graduate student Yuka Irei and associate professor James Davis Reimer from the University of the Ryukyus, along with Dr. Frederic Sinniger from JAMSTEC, has found two new species of encrusting anemones, or colonial zoantharians, in unexpected locations. The study was published in the open access journal ZooKeys. The two species belong to the genus Palythoa, which is commonly found on shallow coral reefs in subtropical and tropical waters worldwide. Surprisingly, the two new species were found living in cracks and caves in the reefs, and do not have zooxanthellae, unlike almost other known Palythoa species. Zooxanthellae are symbiotic, photosynthetic, single-celled algae that can provide host species with energy from the sun. Species of Palythoa are sometimes the dominant benthic organism on shallow coral reefs, and are also common in the pet trade. Their success may in part be due to their ability to host zooxanthellae while also being efficient planktonivores, allowing them to live in a wide variety of coral reef conditions from shallow reef flats to steep and deep reef slopes. However, specimens first found by Irei and Sinniger from shallow caves and cracks in Okinawa and New Caledonia appeared to be unique in their habitat preference. Additionally, analyses showed these specimens lacked zooxanthellae. "One of the species is described from just in front of a landfilled reef coastline on Okinawa Island and it is encouraging to see that there is still some unknown biodiversity just in front of our door", commented Sinniger. "At first, we were surprised at the discovery of specimens, and thought we had one undescribed and unusual species on our hands," said Irei, "but we were even more surprised when DNA analyses showed clearly that there were two different species." Further research by Irei and Reimer in Okinawa revealed additional minor morphological differences between the two species. The new study formally describes these new specimens as two species. "These two species are morphologically very similar," stated Reimer, "with long tentacles to acquire plankton from the water column, and polyps that are curved towards the entrances of cracks or caves for better access to their food source." While genetically distinct, each species appears to have evolved very similar features to adapt to its life in the dark. "These two species provide an excellent example of parallel evolution, as each evolved independently from each other," added Irei. The only reliable way to tell the two species apart asides from DNA are the patterns and markings on their tentacles. Palythoa species are usually colonial, often forming large groups with many polyps. They are known from coral reef environments worldwide, and many species have been shown to contain the palytoxin, a lethal toxin named after the genus. It is not known if the two new species contain toxin.